Peshawar: University of Peshawar’s Law College inked memorandum of understanding with International Committee of Red Cross for promoting International Humanitarian law on Friday. 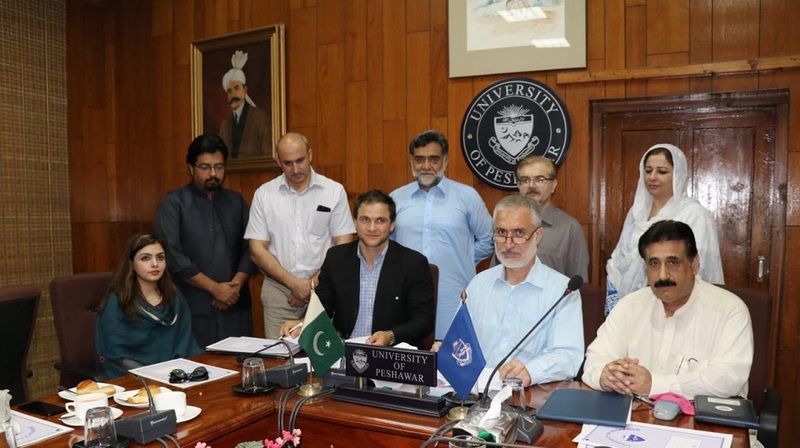 Pro-Vice Chancellor, University of Peshawar Prof. Dr. Muhammad Abid signed the MOU on behalf of the University while ICRC head of Peshawar Sub Delegation Giovanni Trambaiola signed it on behalf of ICRC. The ICRC has already a reputation to work with the University of Peshawar’s Law College and has established Henry Dunant Conference room at Academic Block II after its founder name in January, 2018. Before the signing ceremony, the pro-vice Chancellor hoped that international Humanitarian law capacity building will be strengthened at University through this memorandum. He called upon both parties to work for instilling law abiding students for mustering humanitarian practices. The Principal Law College Dr. Inayat Ullah said that this memorandum will really help his academia due to inclusion of International Humanitarian law at LLB 5years program and LLM discipline. The HOSD ICRC, Giovanni Trambaiola expressed his joy over working with university of Peshawar and showed willingness to work with University Political Science department to give legal assistance in the transitioning of tribal areas in to mainstream KhyberPakhtunkhwa. He briefed the pro -vice chancellor about the ICRC internship program meant for Law students and legal competitions that ICRC holds in a calendar year. The registrar, University of Peshawar Dr.Zahid Gul and Director Planning & Development Mr.Ishtiaq Ullah were also present on this occasion.